A guide to the upcoming week’s most delicious happenings. American Craft Beer Week keeps on bubbling through Sunday with more brew specials at various venues. Colorado’s Avery Brewing Tap takes over the Little Bear, the Surly Goat celebrates aged barrels with Firestone’s David Walker, and Mohawk Bend has rotating specialty flights. For the complete list of events, visit the American Craft Beer Week Website. More information. The documentary film inspired by the book The Fruit Hunters: A Story of Nature, Adventure, Commerce, and Obsession, premieres today. The flick follows actor (and self-proclaimed fruit freak) Bill Pullman, as well as a handful of scientists and food detectives, as they travel to find rare, exotic fruits. Screenings take place this week at various Laemmle Theatres locations. More information. Join farmers, chefs, and local authors as they participate in a panel at the Santa Monica Public Library discussing L.A.’s hidden abundance of food. Stick around after the panel to taste some farmers’ market snacks prepared by chef Mia Wasilevich. The free panel runs from 7 to 9 p.m. More information. In anticipation of Taste of the Nation, Mohawk Bend partners with Golden Road Brewing to host Breakfast in the Bend from 9:30 a.m. to 12:30 p.m. The breakfast, featuring $4 Golden Road brews and $10 grub specials (chili-cheese baked omelet, the famed Mohawk waffle), will raise funds to benefit Share Our Strength’s Breakfast in the Classroom program. More information. Saddle Peak Lodge and Ladyface Ale Companie team for a beer pairing luncheon. The local craft brews will accompany a $55, five-course lunch that features dishes such as asparagus salad, pork belly sliders, and lamb poutine. The luncheon begins at noon; reservations recommended. More information. The Big Read and Culinary Historians of America present a lecture on Arabic food and culture at the Egyptian Theatre. Renowned culinary expert Charles Perry will discuss how the Nile River influenced today’s Middle Eastern food. Following the discussion, guests can sample authentic Egyptian dishes such as kamakh al-tahina and kobeiba aqras. The film Terrorism in Kebab will screen after the tasting. The event starts at 1 p.m.; tickets are $11. More information. West Hollywood becomes New Orleans at Dominick’s fourth annual crawfish boil. From noon to 4 p.m., join chef Brandon Boudet as he cooks up 300 pounds of crawfish and other Louisiana favorites such as boiled artichokes with creole remoulade, roast beef po’ boys, and oysters. 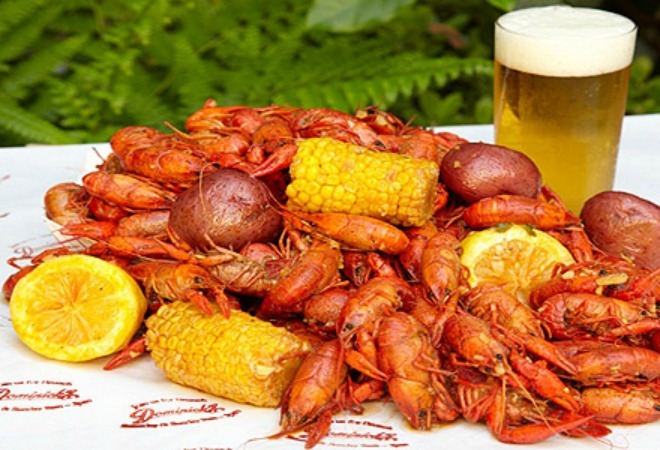 Did we mention the crawfish was flown in from New Orleans? The boil takes place next Saturday, May 25 as well. More information. BÊP Kitchen, Connie Chan’s Vietnamese brunch pop-up, resurfaces in a new location. Starting this Sunday, the $37 eight-course Asian-style brunch will be served at downtown’s Daily Dose Café. This week’s menu includes dishes such as the chung ruoc (deviled eggs, longan apple relish, shredded pork jerky, and sesame oil) and ca rem sua chua (buttermilk gelato with maple-roasted pecans). Brunch begins at 11:30 a.m.; reservations required. More information. Celebrate wine, art, and food in Santa Monica at CRUSH, a tasting event and fundraiser benefitting the 18th Street Arts Center. Explore the Forêt Intérieureart installation by artist Alexandra Grant or just enjoy the live jazz while trying more than 50 wines and nibbles from restaurants such as Muddy Leek, Wilshire, and Library Alehouse. Tickets for the event, which begins at 2 p.m., cost $45 or $50 for VIP. More information. In honor of a group of home cooks who gather each month to cook recipes from Suzanne Goin’s Sunday Suppers at Lucques, Goin and Caroline Styne will host their first book club dinner with a special menu based on the book. Post a photo on Facebook of a dish you made from Goin’s Sunday Suppers for the opportunity to win a free dinner, or enter this Sunday night’s raffle for the chance to win a complimentary signed cookbook. The dinner costs $45; reservations are recommended. More information. Next articleWhere Does California Rank When It Comes To Politeness and Cursing?